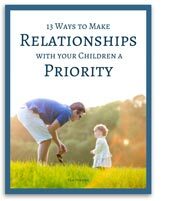 New subscribers get our free guide, 13 Ways to Make Relationships with your Children a Priority! After you subscribe to our list, you can expect to receive about one email per month. We'll send you free resources and articles related to Biblical parenting, new product updates, coupon codes, and occasional news from Doorposts and the Forster family. We hate spam and junk mail and we're committed to protecting your privacy. We will never share your email address with another party. You may unsubscribe or change your subscription at any time using the links at the bottom of our newsletter or by managing your settings in My Account.